Indian Christians especially those of the Syro Malabar and Syro Malankara church are indebted to their faith and to the mission of Thomas, an apostle best known not for his faith but for his doubt. “Doubting Thomas” may have traveled farther with the gospel than any of the other apostles. He always traveling even when Jesus appeared after the resurrection, he was out . The character of Thomas portrayed in the New Testament, chiefly in the Gospel of John, is absolutely consistent. Unless he sees the print of the nails in Jesus’ hands, he says, he will not believe that he is alive. 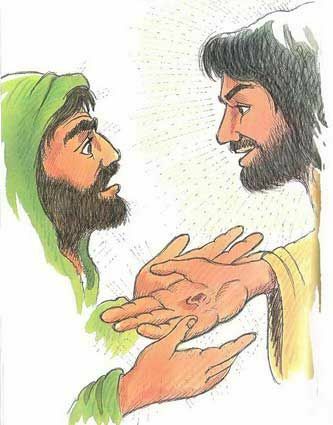 Jesus thereupon shows him the nail marks. Similarly, when Jesus announces he’s heading for Jerusalem and the other apostles urge caution, Thomas responds in character, “Let us go and die with him,” he says, cheerlessly. When Jesus tells the disciples they know where he is going and the way he is going to take, Thomas protests: “We don’t know where you’re going and we don’t know the way either.” (John 14:5) “I am the Way,” replies Jesus. Thomas next turned his attention to southern India, where he labored on the Malabar Coast for many years and established a viable church, even converting a number of Brahmans (members of India’s priestly caste). While the Malabar tradition of his ministry insists that he was a good debater, he is supposed to have won converts more by his example than by his arguments. The tradition says Thomas was martyred in July of A.D. 72 in Mylapore. Thomas is said to be buried on a small hill at Mylapore. The tomb of the saint, was revered not only among Eastern Christians but by Muslims and Hindus as well. It is also reported that some of his remains, regarded as holy relics, were moved to Edessa in Syria, where he had a following because he had sent disciples there. Significant European contact with the Thomas church began only when the Portuguese began to visit India in the sixteenth century. Expecting to find an untouched mission field, they found, to their surprise, an active church. In 1517, two Portuguese visited Thomas’s shrine in Mylapore where, according to report, his tomb was still venerated by Christians and non-Christians alike. In the twenty-first century, the church remains strong in the southwestern state of Kerala, where Christians have long described themselves as “Christians of St. Thomas.” A living tradition of folklore, songs, and dances among the Malabar Christians describes the apostle’s work in south India. When there are doubts about our faith, recite Apostles creed. That will remove our doubts. Feast day of St. Thomas: July 3rd.